It is now compulsory that tribal politics aside, the capital of T&T must be removed in the medium term from its present earthquake- susceptible location in POS to one that is less vulnerable to the damaging effects of a seven and more seismic event that is nearer and less deeper than last Tuesday's traumatic wake-up call. This must be a first step of any natural disaster mitigation/avoidance strategy because were a strong above seven earthquake to strike again, POS will sink as proposed by the UWI seismologist, Dr Illias Papadoupoulos. There is also no confidence-building evacuation plan from POS given its constricted location. T&T will come to a screeching disruptive halt with Point Lisas saving us. 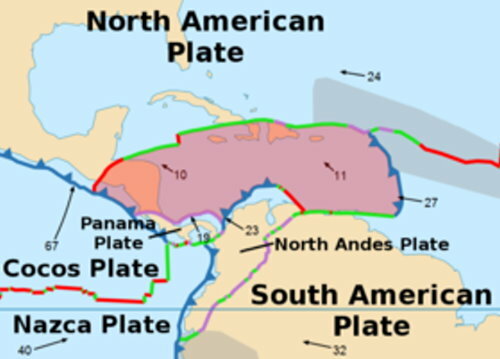 All our records, banking information, governmental infrastructure including the Central Bank will be lost forever in a water soaked grave in the Gulf of Paria under which lies a line of geological/seismic weakness owing to the fracturing convergence of the Caribbean and South American Plates as shown in the image below courtesy of Wikipedia. 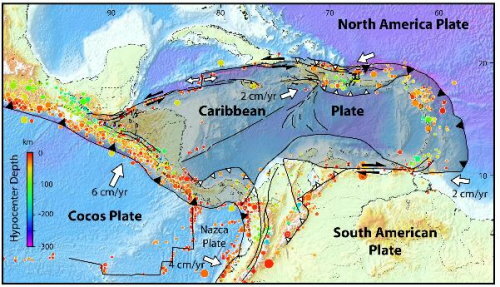 In addition to the annihilation threat posed by the inevitable big earthquake, POS is also exposed to the potential disastrous effects of a Gulf of Paria-generated post-earthquake, plate tectonics tsunami that can also make the capital inoperative and strangled to extinction. Accordingly having regard to the frequency of disruptive flooding occurrences after small showers, the capital must be transplanted to a more sustainable location in Orange Grove for example. This is an urgent national imperative since we must undertake planning and contingency measures to pre-empt and/or reduce the potential disaster that the expected ''Big One" threatens against the integrity, existence and continuing viability of T&T, God being our keeper.